Apple is now selling an unlocked version of the iPhone 5s in the United States via its online store. 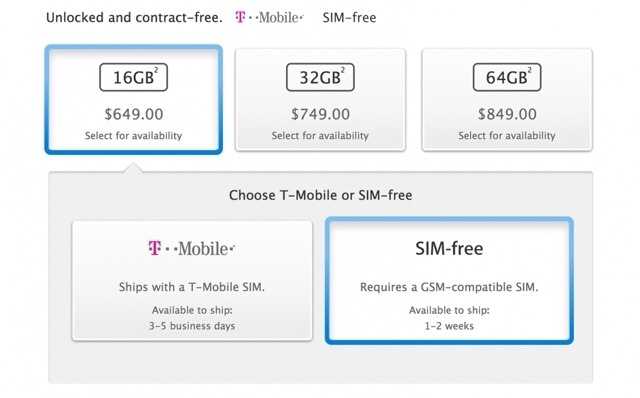 The SIM-Free iPhone 5s is available to ship in 1-2 weeks and requires a GSM-compatible SIM. If you buy a SIM-free iPhone, you will need to purchase a GSM-compatible nano-SIM card separately. In the United States, you can purchase such a SIM from AT&T or T-Mobile. When you travel internationally, you can use a nano-SIM card for iPhone 5s from a local GSM carrier. The unlocked iPhone 5s model is A1533 (GSM).